We offer a complete, year-round religious education (RE) experience for all children and youth. Volunteers led by our Religious Education Director watch the youngest among us in the nursery and teach the school-age children lessons centered around our values as Unitarian Universalists in the classroom. 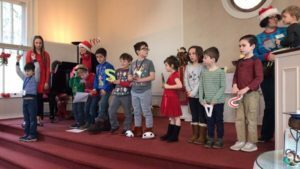 On the first and third Sundays of each month, children and youth begin in the Meeting House with the congregation for the chalice lighting and a special “Message For All Ages”, and we sing as they carry the chalice downstairs to the classroom after the “Message For All Ages”. On the second and fourth Sundays of the month, children can go straight upstairs for chapel in the Marge Brown Room. 1. Each person is important. 2. Be kind in all you do. 3. We’re free to learn together. 4. We search for what is true. 5. All people need a voice. 6. Build a fair and peaceful world. 7. We care for the earth. 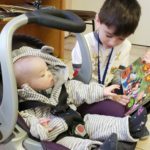 Young children (ages 3-7) participate in Spirit Play, a Montessori-based program designed to help children use religious language and stories to create a spiritual community and find meaning through wondering and art. Children (grades 2-6) learn about UU values and world religions to begin exploring their own answers to such questions as: Who am I? What is my purpose? How do I choose to live my life? Youth (grades 7-12) learn to apply UU values and principles in their daily lives through leadership development, worship, and social action. Activities include discussion, films, games, art, drama, cooking and social justice work. We offer supervised play in our nursery room for babies and toddlers during the service. The nursery is located downstairs in the hallway near the Religious Education classrooms. If you and your children are new to UU Farmington, please arrive a bit early so you can meet our Director of Religious Education (DRE) and become oriented to our building. 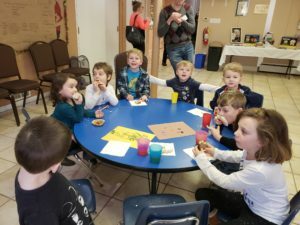 Children are welcome to either remain with their parents or move to their classrooms after our gathering time as community, with the nursery available throughout the service. After a few visits, we ask parents to contact the DRE to register their children so we can better communicate with you and better know your children. We want your whole family to find your time at UU Farmington to be comfortable, nurturing, and enjoyable. For more information, call us at 248-478-7272 or email us at info@uufarmington.org.